The Aces are often seen as beginnings and gifts, receiving a gift or chance as it were. Having a gift, and not using it is futile, but it is also important to know that once we have done what we must with the help of this gift, we should return it to the world. The Ace of Swords is reminiscent of once such gift that was given to a man named King Arthur of Camelot. In some legends it is told that the Lady of The Lake gave it to him, in others that he extracted it from a stone. This legendary sword was named Excalibur, attributed with magical powers that protected King Arthur when he went into battle. Legend tells us that whomever possessed the Excalibur sword and scabbard would not bleed or suffer from a wound inflicted upon them. Armed with this sword Arthur created a world called Camelot, with all its lessons, legends, magic and myth. At some point he lost the scabbard, it is said that Morgan Le Fey stole it and threw it into the lake, never to be seen again. With the scabbard lost, Arthur was eventually wounded in battle. He died from these wounds but not before he returned the sword named Excalibur to its rightful owner, the Lady of The Lake. He had completed his mission, used the gift given to him in a manner that was righteous and good, and when the time arrived he returned it to the world by giving it back to the Lady of The Lake. Arthur was given an opportunity to make a difference when he was entrusted with Excalibur. Once he was done he did not keep the gift out of greed, he gave it back to be given to the next worthy recipient. Similarly when we are gifted with an idea, for example, we should not keep it to ourselves, instead we should give it back to the world – the Universe – so that the next one can take the idea and improve on it. Thus we become part of the natural evolution of this gift. King Arthur could have held onto the sword and not done anything with it, instead he created a world called Camelot. A world that taught and still teaches many lessons, and is still kept alive in legend and magic. 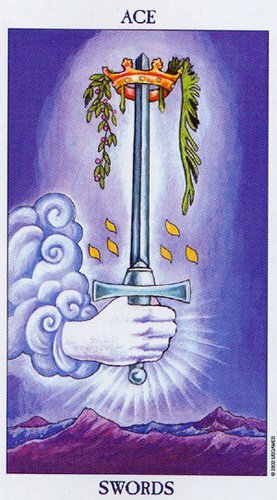 The lesson in today’s card is to remind us to honour the gifts we receive. To not jealously possess them for ourselves alone but to share them with the world, to recognise that by passing this gift along to others we are keeping it alive, and becoming a part of the natural evolution of the gifts we receive.